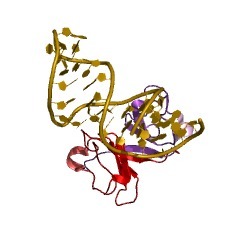 This RNA binding domain is found at the amino terminus of transcriptional antitermination proteins such as BglG, SacY and LicT. These proteins control the expression of sugar metabolising operons in Gram+ and Gram- bacteria. This domain has been called the CAT (Co-AntiTerminator) domain. It binds as a dimer (PUBMED:9305644) to short Ribonucleotidic Anti-Terminator (RAT) hairpin, each monomer interacting symmetrically with both strands of the RAT hairpin (PUBMED:11953318). In the full-length protein, CAT is followed by two phosphorylatable PTS regulation domains that modulate the RNA binding activity of CAT. Upon activation, the dimeric proteins bind to RAT targets in the nascent mRNA, thereby preventing abortive dissociation of the RNA polymerase from the DNA template (PUBMED:10610766). 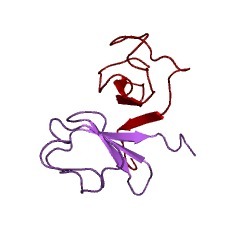 This RNA binding domain is found at the amino terminus of transcriptional antitermination proteins such as BglG, SacY and LicT. These proteins control the expression of sugar metabolising operons in Gram+ and Gram- bacteria. This domain has been called the CAT (Co-AntiTerminator) domain. It binds as a dimer [(PUBMED:9305644)] to short Ribonucleotidic Anti-Terminator (RAT) hairpin, each monomer interacting symmetrically with both strands of the RAT hairpin [(PUBMED:11953318)]. In the full-length protein, CAT is followed by two phosphorylatable PTS regulation domains that modulate the RNA binding activity of CAT. Upon activation, the dimeric proteins bind to RAT targets in the nascent mRNA, thereby preventing abortive dissociation of the RNA polymerase from the DNA template [(PUBMED:10610766)]. There are 6789 CAT_RBD domains in 6789 proteins in SMART's nrdb database. Taxonomic distribution of proteins containing CAT_RBD domain. This tree includes only several representative species. The complete taxonomic breakdown of all proteins with CAT_RBD domain is also avaliable. Click on the protein counts, or double click on taxonomic names to display all proteins containing CAT_RBD domain in the selected taxonomic class. Solution structure of the LicT-RNA antitermination complex: CAT clampingRAT. LicT is a bacterial regulatory protein able to prevent the prematurearrest of transcription. When activated, LicT binds to a 29 base RNAhairpin overlapping a terminator located in the 5' mRNA leader region ofthe target genes. We have determined the solution structure of the LicTRNA-binding domain (CAT) in complex with its ribonucleic antiterminator(RAT) target by NMR spectroscopy (PDB 1L1C). CAT is a beta-strandedhomodimer that undergoes no important conformational changes upon complexformation. It interacts, through mostly hydrophobic and stackinginteractions, with the distorted minor groove of the hairpin stem that isinterrupted by two asymmetric internal loops. Although different insequence, these loops share sufficient structural analogy to be recognizedsimilarly by symmetry-related elements of the protein dimer, leading to aquasi- symmetric structure reminiscent of that observed with dimerictranscription regulators bound to palindromic DNA. Sequence analysissuggests that this RNA- binding mode, where the RAT strands are clamped bythe CAT dimer, is conserved in homologous systems. RNA recognition by transcriptional antiterminators of the BglG/SacYfamily: functional and structural comparison of the CAT domain from SacYand LicT. Transcriptional antiterminators of the BglG/SacY family are regulatoryproteins that mediate the induction of sugar metabolizing operons inGram-positive and Gram-negative bacteria. Upon activation, these proteinsbind to specific targets in nascent mRNAs, thereby preventing abortivedissociation of the RNA polymerase from the DNA template. We havepreviously characterized the RNA-binding domain of SacY from Bacillussubtilis and determined its three-dimensional structure by both NMR andcrystallography. In the present study, we have characterized theparalogous domain from LicT and we present the first structural comparisonbetween two BglG/SacY family members. Similar to SacY, the RNA-bindingactivity of LicT is contained within the 56 N-terminal amino acid residuefragment corresponding to the so-called co-antiterminator (CAT) domain.Surface plasmon resonance affinity measurements show that, compared toSacY-CAT, LicT-CAT binds more tightly and more specifically to its cognateRNA target, with a KD value of about 10(-8) M. The crystal structure ofLicT-CAT has been determined at 1.8 A resolution and compared to that ofSacY-CAT. Both molecules fold as symmetrical dimers, each monomercomprising a four-stranded antiparallel beta-sheet that stacks against thebeta-sheet of the other monomer in a very conserved manner. Comparison ofthe proposed RNA-binding surfaces shows that many of the conserved atomsconcentrate in a central region across one face of the CAT dimer, whereasvariable elements are mostly found at the edges. Interestingly, theelectrostatic potential maps calculated for the two molecules are quitedifferent, except for the core of the RNA-binding site, which appearsessentially neutral in both structures. From genetic to structural characterization of a new class of RNA-bindingdomain within the SacY/BglG family of antiterminator proteins. SacY is the prototype of a family of regulatory proteins able to preventtranscription termination. It interacts with a 29 nucleotide RNA sequenceable to fold into a stem-loop structure and partially overlapping with aterminator sequence located in the 5' leader mRNA region of the gene itcontrols. We show here that the N-terminal fragment of SacY, SacY(1-55),and the corresponding fragments of other members of the family haveantiterminator activities with efficiency and specificity identical tothose of the full-length proteins. In vitro, this activity correlates withthe specific affinity of SacY(1-55) for its RNA target. UV meltingexperiments demonstrate that SacY(1-55) binding stabilizes the RNA targetstructure. The NMR solution structure of SacY(1-55) is very similar tothat obtained in the crystal (van Tilbeurgh et al., 1997): the peptide isfolded as a symmetrical dimer without any structural homology with otherRNA-binding domains yet characterized. According to a preliminary NMRanalysis of the SacY(1-55)-RNA complex, the protein dimer is not disruptedupon RNA binding and several residues implicated in RNA recognition arelocated at the edge of the dimer interface. This suggests a new mode ofprotein-RNA interaction. 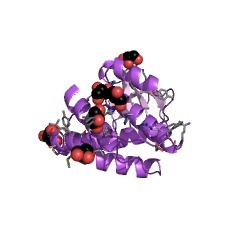 Crystal structure of a new RNA-binding domain from the antiterminatorprotein SacY of Bacillus subtilis. SacY belongs to a family of, at present, seven bacterial transcriptionalantiterminators. The RNA-binding and antitermination capacity of SacYresides in the 55 amino acids at the N-terminal [SacY(1-55)]. The crystalstructure at 2 A resolution shows that SacY(1-55) forms a dimer in thecrystal, in accordance with the NMR solution structure. The structure ofthe monomer is a four-stranded beta-sheet with a simplebeta1beta2beta3beta4 topology. One side of the sheet is covered by a longsurface loop and the other side forms the dimer interface. The dimer isstabilized by the orthogonal stacking of the two beta-sheets. The crystalstructure is in excellent agreement with the NMR solution structure(r.m.s. distance for C alpha coordinates is 1.3 A). The structure ofSacY(1-55) reveals a new RNA-binding motif.